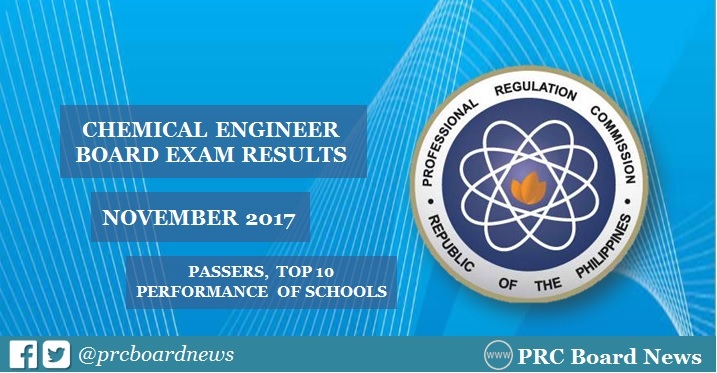 MANILA, Philippines – The Professional Regulation Commission (PRC) and the Board of Chemical Engineering released results of November 2017 Chemical Engineer (ChemEng) board exam on Wednesday, November 22 or in two (2) working days after the last day of examinations. The official list of passers, top 10 (topnotchers), top performing schools and performance of schools are available on this page as announced online. UPDATE: As announced, 627 out of 942 passed the exams. PRC administered the Chemical Engineer licensure exam in the cities of Manila and Cebu on November 18, 19 and 20, 2017. The three-day examination covered the following subjects: physical and chemical principles, chemical engineering principles and general engineering, ethics and contracts. According to PRC Resolution No. 2016-1019, the target release of results for the November 2017 ChemEng board exam is on Wednesday, November 22, 2017 or in two (2) working days after the exam. In the May 2017 Chemical Engineer board exam, results were out in two (2) working days. PRC named 310 out of 561 who have passed the exams. De La Salle University (DLSU) - Manila topped the schools with 94.12% (32 out of 34 passed). Wayne Lorenz Bagano Tandingan from the University of San Carlos (USC) led the passers with 85.20%. In the November 2016 exams, results were also released in just 2 working days. PRC named 534 out of 918 who have passed the series of tests. University of the Philippines - Diliman (UPD) hailed as the top performing school. DLSU-Manila alum Clarence Joseph Uy Co topped the board with 85.50%.